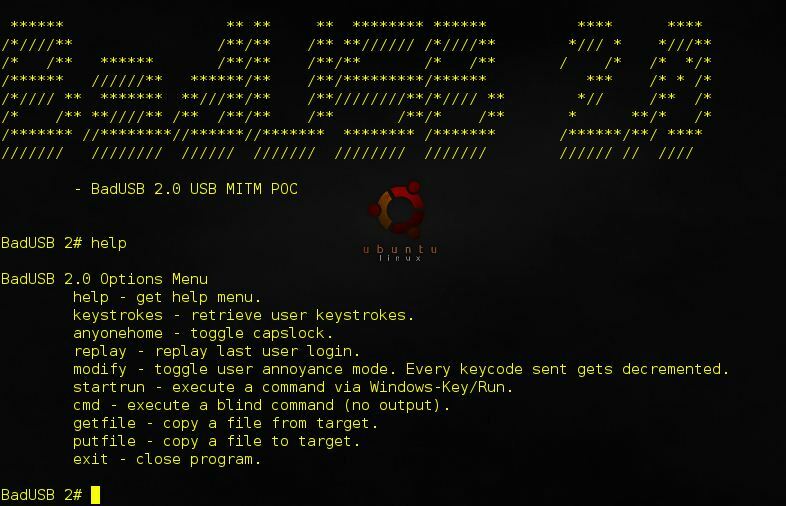 Browse: Home / BadUSB 2.0 USB MITM POC. + Eavesdrop. Once the keyboard has been registered to the target all keystrokes are captured to the ‘/tmp’ folder. + Replay. The POC code will automatically detect ‘ctrl-alt-delete’ and assume it is a login session. It stops recording once the ‘enter’ key is pressed. Ay any time the ‘replay’ command can be given to automatically authenticate to the workstation. + Fabricate. Start/Run or generic commands can be issued to the target operating-system just as if you were at the keyboard. + Exfiltrate. I’ve implemented a PowerShell exfiltration POC that uses the ‘morse code’ technique (LEDs) to exfiltrate data. Using custom HID output reports is faster but MS Windows restricts read/write access from Win 2K. In short, this is a very rudimentary POC, and did I mention very slow! BadUSB. I did not actually implement a POC for this. The Facedancer has plenty of example code that can be used to fake USB peripherals to the host, but it would be nice to implement some of the BadUSB “Kali Nethunter” type attacks here. git clone https://github.com/withdk/badusb2-mitm-poc && cd badusb2-mitm-poc ./badusb2.py SETUP WALKTHROUGH: The main requirement is the FTDI USB/Serial adapter (ftdi_sio modules) which "should" be installed by default on Ubuntu 14.04. When connecting a Facedancer you should get: $ dmesg -- snipped -- [ 1725.385252] usb 1-4: New USB device strings: Mfr=1, Product=2, SerialNumber=3 [ 1725.385256] usb 1-4: Product: FT232R USB UART [ 1725.385259] usb 1-4: Manufacturer: FTDI [ 1725.385262] usb 1-4: SerialNumber: AI02BP4J [ 1725.398297] ftdi_sio 1-4:1.0: FTDI USB Serial Device converter detected [ 1725.398351] usb 1-4: Detected FT232RL [ 1725.403446] usb 1-4: FTDI USB Serial Device converter now attached to ttyUSB0 If this is the first time using the Facedancer's you will need to flash your devices so follow the goodfet tutorial found here: http://goodfet.sourceforge.net/tutorial/ You will need to repeat the above steps twice, one for each Facedancer. When both Facedancers are attached to the MITM system you should now have two devices registered: $ ls /dev/TTYUSB* /dev/ttyUSB0 /dev/ttyUSB1 *** IMPORTANT NOTE *** Before running the BadUSB2 m2p/m2h scripts ensure the Facedancer 2 peripheral is connected first so it registers on '/dev/ttyUSB0'. To run it we need to terminals open: # Run on the first terminal (run this first) sudo ./m2p.py info # Run on the second terminal sudo ./m2h.py I've noticed on some Windows builds that you need to re-run the python scripts in order to get the operating-system to register the keyboard. I haven't looked into why this is. The main requirement is the FTDI USB/Serial adapter (ftdi_sio modules) which "should" be installed by default on Ubuntu 14.04. You will need to repeat the above steps twice, one for each Facedancer. Before running the BadUSB2 m2p/m2h scripts ensure the Facedancer 2 peripheral is connected first so it registers on '/dev/ttyUSB0'. I've noticed on some Windows builds that you need to re-run the python scripts in order to get the operating-system to register the keyboard. I haven't looked into why this is. ← Bluto v1.1.22 ~ DNS Recon | Brute Forcer | DNS Zone Transfers | Email Enumeration | User Enumeration.